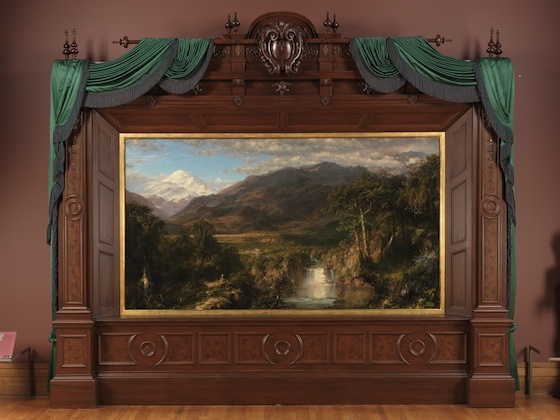 If Thomas Cole represents the first generation of the Hudson River School of painters, then Frederic Edwin Church, the only pupil Cole ever instructed, certainly represents the generation that followed. Yet despite the teacher/student relationship that they shared, they differed in the ways in which they conceived of the American landscape. For Cole, landscape painting was a pictorial device in which to reach allegorical or narrative ends. 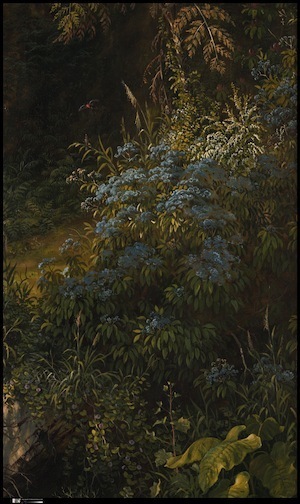 While Church at first followed his teacher’s instruction in this regard, the younger artist set allegory and narrative aside in favor of a more focused and precise depiction of nature. Church was born in Hartford, Connecticut, to a wealthy family; his father was a prosperous silversmith and watchmaker. Daniel Wadsworth, one of the most influential art patrons of his time and the founder of the oldest public art museum in the United States—the Wadsworth Atheneum—introduced Church to Cole in 1844. Although still but a teenager, Cole remarked that Church possessed ‘the finest eye of drawing in the world.’ Church’s immense skill is demonstrated by his election as an Associate of the National Academy of Design in May of 1844. Just barely 24 years of age, Church was the youngest artist so honored. But one year later his status was to that of Academician. Clearly, his career was off to a meteoric beginning. Today, Church is most famous for his large, blockbuster-sized landscapes. Among the many he painted, Niagara (1857) and The Heart of the Andes (1863) are justifiably the most famous. Together, these two paintings vaulted Church to the position of the most famous painter in the United States. Although Church was not the first artist to depict the Great Falls of Niagara—John Vanderlyn, John Trumbull, and Cole had made attempts earlier in the nineteenth century—he was the first to somehow capture the roaring essence of what many then considered to be the greatest natural treasure in the United States. In contrast to earlier painters, however, Church placed the viewer close to the falls and suspends them immediately above the ledge from which the water thrillingly descends. Even the panorama-like horizontal format and the colossal size (106.5 x 229.9 cm) accentuate the sublime nature of the composition. Even though Church depicted the Canadian side of Niagara Falls, this image became wildly popular, both in the United States and in Europe, and has, over time, become a uniquely “American” image. When completed in 1857, Church exhibited this work at a one-painting show at the New York commercial art gallery of Williams, Stevens, and Williams. Within two weeks of the exhibition’s opening, more than 100,000 visitors had paid twenty-five cents each to view Church’s masterwork. The art-loving public was clearly fascinated and enchanted by this image. Many used opera glasses to discern the minute details that were only visible upon close inspection. Church, ever the businessman, generated additional revenue through the sale of chromolithographs of the painting. After a successful exhibit in New York, Church then toured Niagara to various cites on the east coast, and eventually even took the image to London and Paris. In all, Niagara made Church both a wealthy man and amongst the most famous of American painters. If 1857 marks the year of Church completed Niagara, it also marks his return to South America, a location the artist had visited just four years prior. Cyrus Field, a wealthy New York businessman who was to become one of Church’s most reliable patrons, financed both of these adventures. Church spent more than two months in South America—most of this in Ecuador—and became keenly interested in Alexander von Humboldt, the Prussian naturalist and acclaimed author of Kosmos. This two-volume study of geology and natural history was published in Germany in 1845 and 1847. English translations followed shortly thereafter, and Humboltdt’s theories had an immense impact on Church’s views of the natural world. When the artist returned to his New York studio, he arrived with countless preparatory drawings and watercolors from which to base a monumental composition. And complete a monumental composition Church did, not only in size (168 x 302.9 cm), but also in visual scope. Church unveiled the painting at Lyrique Hall on 27 April 1859, and was moved to the Tenth Street Studio Building two days later. Like Niagara, The Heart of the Andes was more for contemporary viewers than just a painting; countless writers agreed that seeing the painting was an experience. Church placed the painting in a darkened room and dramatically illuminated it through the use of gas lamps. An enormous frame that resembled window molding only increased the painting’s visual impact. As with Niagara, the twenty-five cent ticket price for The Heart of the Andes entitled viewers to borrow a pair of opera glasses and a set of pamphlets that explained the composition through the geographical ideas von Humboldt wrote of in his Kosmos. Pamela and I have just returned from a visit to the most wonderfully beautiful painting which this city has ever seen–Church’s “Heart of the Andes”–which represents a lovely valley with its rich vegetation in all the bloom and glory of a tropical summer–dotted with birds and flowers of all colors and shades of color, and sunny slopes, and shady corners, and twilight groves, and cool cascades–all grandly set off with a majestic mountain in the background with its gleaming summit clothed in everlasting ice and snow! I have seen it several times, but it is always a new picture–totally new–you seem to see nothing the second time which you saw the first. We took the opera glass, and examined its beauties minutely, for the naked eye cannot discern the little wayside flowers, and soft shadows and patches of sunshine, and half-hidden bunches of grass and jets of water which form some of its most enchanting features…You will never get tired of looking at the picture, but your reflections –your efforts to grasp an intelligible Something–you hardly know what –will grow so painful that you will have to go away from the thing, in order to obtain relief. You may find relief, but you cannot banish the picture–It remains with you still. It is in my mind now–and the smallest feature could not be removed without my detecting it. If Church had ever read Twain’s remarks, there can be little doubt the artist would have been delighted. Church aspired to take many different components and assemble them into a cohesive and believable whole. The monumental snow-capped mountain in the deep background is Mt. Chimborazo, one of the highest peaks in South America. Moving to the foreground, Church leads the viewer through a variety of topographical zones which all contain unique flora and fauna. There is but a little human presence in this vast depiction of space.A colonial Spanish hacienda appears in the central middle ground, resting on the banks of a river. This waterway flows to the viewer’s right, eventually arriving at a waterfall—a Niagara in miniature—on the right side of the painting. A well-traveled footpath in the left foreground leads the eye to a pair of people who worship before a simple wooden cross. Beyond these ‘major’ elements, the composition is filled with minute details unobservable in any reproduction. Flowers bloom, birds flutter, water flows, and wind seems to blow. Niagara and The Heart of the Andes are only two paintings from a long and productive professional career that spanned North and South America, Europe, and the Middle East. However, they stand as excellent examples of Frederic Church’s extensive oeuvre and his practices as a nineteenth-century artistic entrepreneur. Whereas Thomas Cole, Church’s artistic mentor, used the landscape as a visual tool on the path towards allegory and narrative, Church instead placed great artistic focus on exactitude and specificity in regards to flora, fauna, and geological formations. The huge size, panoramic views, and incredible detail vaulted him into the highest ranks of nineteenth century American landscapists. Cite this page as: Dr. Bryan Zygmont, "Frederic Edwin Church, Niagara and Heart of the Andes," in Smarthistory, August 9, 2015, accessed April 22, 2019, https://smarthistory.org/church-niagara-and-heart-of-the-andes/.